With Special Love for Kid's Yoga Day! We are SO proud of the NJ yoga studios celebrating Kid’s Yoga Day this Year! NJ is showing up STRONG for this growing, international celebration of mindfulness and movement for kids, with ambassadors all across our amazing Garden State. Kids’ Yoga Day is looking to break down the socioeconomic and cultural barriers of society by providing access to yoga to those who would otherwise not have the opportunity, and to help prevent many conditions and challenges facing our youth and their families such as diabetes, high blood pressure and cholesterol, obesity and stress. Maria Friedman of Stronger By Touch proudly presents A Night of Mala Making with Krista Lynn to benefit Mary’s Place by the Sea. Light refreshments will be served. Everyone will receive a goodie big which includes $15 off a one hour or longer session. This truly is a wonderful event of community and giving back to an amazing organization – Mary’s Place. Come get inspired amongst like minded people, share intentions and give a gift to yourself as well as to an amazing organization. THIS is how you beat the mid-week slump! Please join Lisa Abramson for our community acupuncture event every Tuesday from 1-3. Then come back for an amazing offering on Wednesday: A restorative practice aimed to aid in full recovery and a steady yoga practice! We invite you to meet our four professionals who can guide you in living your life with much less stress. Jamie Sussex Turner is the “Less Stress Coach” and author. She will point out ways to recognize stress when you’re in the middle of it and how to navigate out of it. Aaron Ellis is the owner of “Live Life Moving” a wellness studio in Asbury Park. He will brief us on the science of how regular exercise can beat stress every time. Nourish Coaches Debbie Peterson and Wendy Bright-Fallon will talk about how stress triggers bad eating habits and offer healthier ways to cope. Lisa Broderick Triolo is the founder of Ohana Rising Yoga School in Ocean Grove. Her belief is that we fully can be ourselves without fear and will close out the night with stress relieving deep breathing exercises. Let the music move you! When music accompanies our classes, it can be inspiring , but when the music is live it becomes truly sublime…Join Dana for a very special vinyasa accompanied by her Italian musical partner, violin virtuoso Gabriele Savarese. We will begin with a harmonious centering, a fluid asana practice with Gabriele on guitar, then we will complete the experience with a deep, integrative relaxation to Dana’s soothing harmonium and vocal lullaby with the sounds of Gabriele on electric violin. A Journey through the Chakras: Root Chakra: What we attract, create, and repel in our lives depends on the health of our energy body – the chakras. Awakening and developing every chakra results in a balanced, integrated, and harmonious sense of self that is able to relate consciously with others, the world, ourselves, and the unknown. In the first workshop of this series, we will get to down to the root of it: The Root Chakra, the foundation of our energy body. Just like a building needs a strong foundation, your energy body needs a strong foundation too. When the root chakra is properly functioning, we feel grounded and able to take care of our basic needs. We feel comfortable in our body and secure on the planet. In order to develop the higher chakras, one must have a sound foundation in the lower triangle and the root chakra is where it all begins! Join Danielle in using postures and meditations to balance the chakras and empower yourself from within! Join Jeff for Maha Sadhana! Based on the traditional Hatha Raj practice, this is a celebration of yoga through an all levels practice that will include pranayama (breathing), asana (movement), meditation, and discourse that will create space to move deeper into your practice and experience the heart of yoga. The goal of the workshop is to provide a bridge between your yoga practice and common sense self-protection. The training is effective, safe and fun. Our methodology is based upon the Japanese martial art of Budo Taijutsu and the principles of alignment-based Hatha Yoga. We’ll study proper body alignment, integration and organization for enhancing our yoga practice. We’ll also learn practical self defense moves, including: striking in self-defense and escaping an attacker, as well as, flexibility, meditation and breathing. With Jennifer Heflin — Reiki Master. 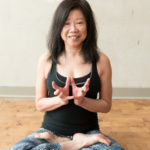 Jennifer will guide you through meditations, breathing practices and awareness techniques which will help you to feel poised, present and live with a greater sense of joy. All attendees will go home with a clear quartz Reiki-infused crystal. Enter to win a FREE Reiki Session with Jennifer. Yoga integrates common events into a vision of the divine and interprets diversity as a door do transformation. But how are we to integrate the uncommon horrors of the Holocaust into such transformative experience? Is it reasonable to interpret the systematic annihilation of an entire people as anything other than what it is? Join us for a talk about Holocaust victims who were schooled in mystic traditions and a discussion on seeing “histories darkest hour” through Yoga philosophy. Handstand practice changes your perspective. Turn your world upside down and realize your full potential. Virgile Peyramaure is a world-renowned circus performer known for his handstands and hand-to-hand balancing acts. He has over 30 years of experience training people to invert safely. His resume includes Big Apple Circus (performer and Artistic Director) and Cirque du Soleil (performer and Coach). He is Google’s Handstand Coach. This workshop will focus on the development of basic handstand skills. Placing emphasis on proper form and position, as well as the fundamentals of spotting. Kids naturally love to help and receive great joy by using Reiki! They have the opportunity to offer their love to their self, families, friends, animals, and planets. Reiki is pure love. It is the light that shines in every living thing. Bringing Reiki, a simple energy healing technique, to kids deepens clarity and validates their inherent abilities. The workshop is conducted in a kid friendly environment. Parents are welcome to stay in a helping capacity. Children will learn to what Reiki is through creative art and activities. Breathe, sound & move into stillness. Tap into your limitless inner power to access your deepest healing. In this Sonic Bliss Yoga workshop we will use a special breathing exercise followed by joyful movement to live music to tune into our creative healing nature. Simple mantras will be employed leading us to tune into our chakras or energy centers. We will end with restorative poses while experiencing a chakra sound healing session utilizing singing bowls, voice and harmonium.